01.) Annelise had Monday off from school so we did the only logical thing. We slept late (well, at least later than normal with no alarms set) and went out for breakfast. She had to bring her Rainbow Loom inside with her because she was in the middle of some crucial looming and that just. can't. wait. Sidenote: I absolutely love the creativity of Rainbow Loom but am up to here with all the thousands of bands here, there and everywhere despite my best efforts to corral them. 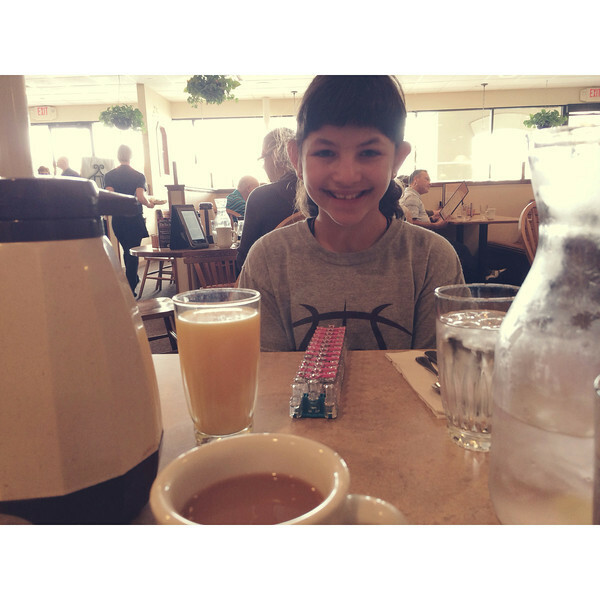 We've always been fans of IHOP (as you know) but we've recently discovered a new-to-us place, The Egg and I. Do y'all have one of those? If you do I highly recommend you visit post haste. 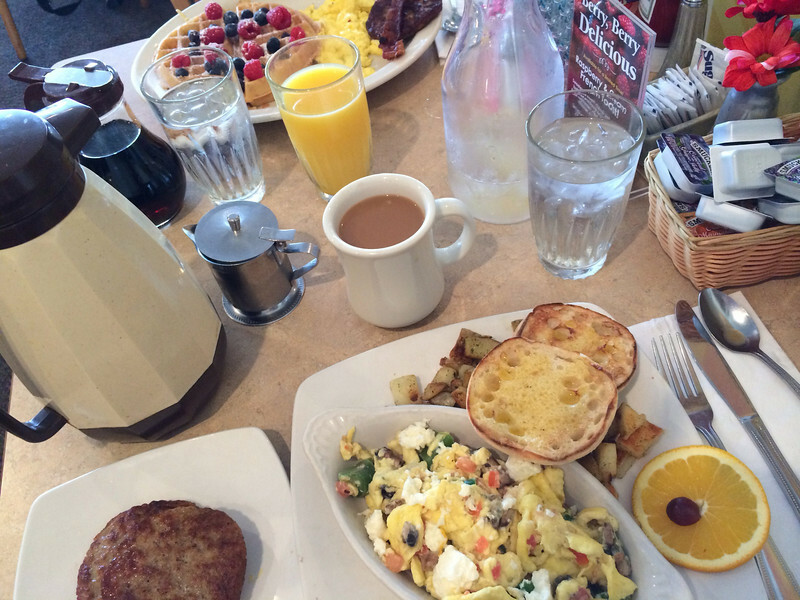 And yes, I got the same exact breakfast I ordered the Friday before on my date with Scott because it's truly scrumptious (it's called the Athena Scramble, if you're ever so inclined). Annelise got the Patriot waffle combo and ate almost the entire thing. 02.) 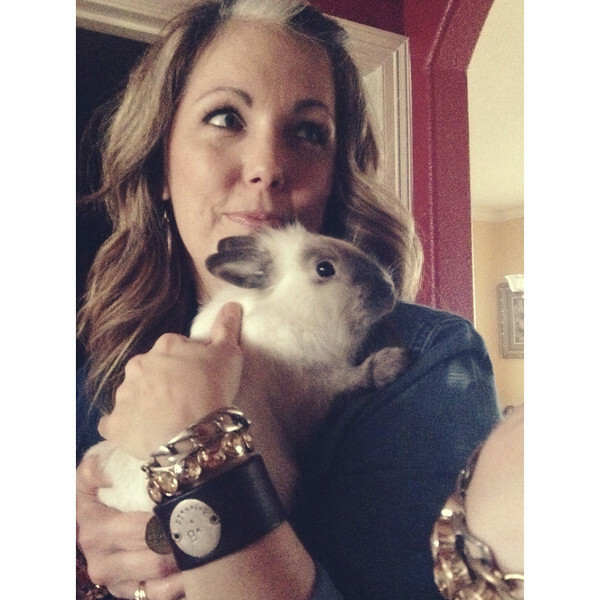 I couldn't resist taking a mirror selfie with Snowball the other day (well, actually Annelise snapped it because my hands were full of rabbit). He was at first intrigued by the sight of another rabbit in the mirror, like maybe he'd have a friend after all (seeing as we have absolutely no plans of getting another one ever), then he moved on to feeling cheated. He's such a sweet rabbit but we've had to confine him more to his cage or behind the baby gate in our morning room because it's a tile floor and much easier to clean up (he'd been having accidents, possibly intentional ones, on our family room rug). He's semi-litter boxed trained but not when he's out of his cage. We need to be more disciplined with his litter box training but he's hard to catch to get him back to his box when given free reign. 03.) After our breakfast date Annelise and got our craft on in the form of subway art slash collage canvases. I'd been itching to make some ever since reading about Shannon's obsession with them. You also need to think of a word or short phrase that makes you happy because you're about to make a slight commitment to it. 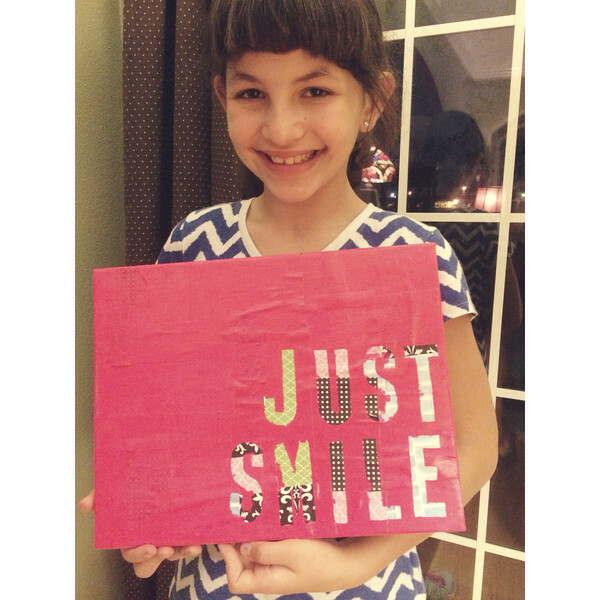 And her final result after peeling the letters off and a final layer of Mod Podge. Annelise chose neon pink which required eleventy thousand coats plus an in-between coat of regular hot pink and still shows some of the patterned paper through it. Wonky is where it's at. 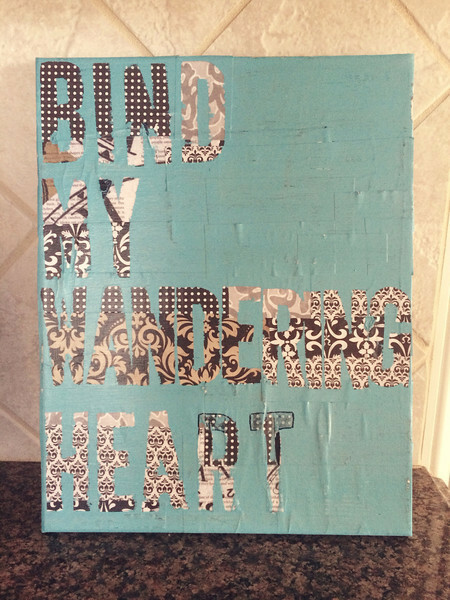 I've never worked with Mod Podge without getting bubbles, so you just have to embrace this imperfection. There might also be paint that got under the letters or maybe the letters pulled off a bit of paint or paper when you pull them off. You've got to let it go man. I was stubborn and determined to cram my "wandering" on there, so therefore it looks smushed. I'm debating going back to outline the letters with a black Sharpie define it better since the patterned paper is, um...shall I say busy? These things are addictive. I've already bought a few more canvases for whenever future creative urges strike. The blinking cursor is mocking me and for the life of me I can't come up with two more things to finish Five for Friday. 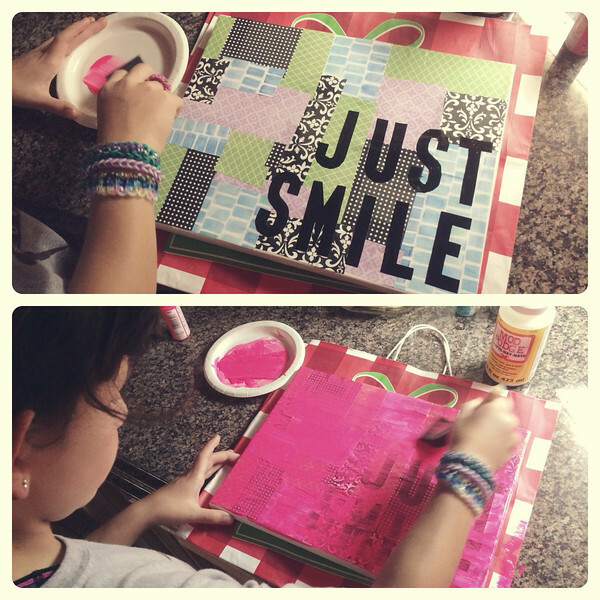 I can see myself (excitedly) doing these kinds of art projects with Mini as she gets older. At this point, we stick with coloring with washable crayons, paints, and markers. I thought maybe craftier crafts would be added to the mix, but she got the Rainbow Loom for Christmas and it was PROMPTLY re-shelved until further notice. Annelise loves her Rainbow Loom, and I love the creativity, but the bands seem to be everywhere all. the. time. I've tried to keep them contained in a storage box and several baggies but they're still like Christmas tree needles. I love, love the canvas art! I am really getting into Mixed Media Collage and saw this technique. Fun lady to watch is Christy Tomlinson. It seems the vinyl letters worked better than the scrapbook letters. Awesome job, ladies!